The Gezi Park barricades in Istanbul, the OWS occupation of Zucotti Park in New York City, the tents of the indignados’ movement in Spain, the London blackberry riots, the seizure of Tahrir Square in Cairo to demand the overthrow of a dictator… Architecture feels that essential questions for its activity are being addressed in each and every one of those situations as new forms of social coexistence and relationship are being configured and new spaces for encounter and conflict produced. And yet, we seem unable to relate to them and grasp their significance as we fall again and again into old metaphors and tools. Our working hypothesis will be the following, if the modern architectural discipline—its theories, strategies and tools—emerges along the modern liberal state and its particular understanding and functioning of politics as the management and administration of life, the recent forms of political action outpouring from their confinement by reclaiming a new relation to the sensible, demand—and might help develop—a new understanding of architecture, one that makes it evolve from a technical and disciplinary knowledge towards a critical practice integrated into the action of the multitude. Until the late 18th century, as the western men faced the large unknown areas of the world, cartographers followed the long-held tradition of livening those uncharted spaces with prodigious imagination, either with fantastical beasts and monsters or with never seen imaginary geographies . By the 19th century the new science, heir of the englightened reason, put an end to this fantasy, at least to the cartographer’s, so as to conjure up a new and absolute blank in the lands yet unconquered by the measurements and representations of the new Geograhy. A blank which was of course just another kind of fantasy. Continents as Africa or Australia were far from empty but inhabited by complex worlds and societies that were erased from western maps, and minds, at a stroke. These “newly found” blank zones were, first of all an affront for our Englightened Man, but they also symbolized with accute precision the process of construction of space as a peculiar abstract empty void independent of the lives of the people that unfolded unto it as a mere stage with no social or political implication. Characters of very different background, kings and national governments among them, would contribute to make economically and militarly viable the expeditions that little by little filled in the blanks and left them good and ready for the dealing out that was to follow . Science and knowledge had become prominent tools in the hands of the 19th century empire’s colonial expansion, an ongoing battle against an other reality that had to be subdued through erasure and the mapping out of a new image. Why then do we reclaim such an appalling model to inform our action? Because we consider an urgency to uphold knowledge and research as something essential for something as fundamental and apparently obvious as the survival of our species. That is why we think is time for our University to bring back knowledge to the streets, open up its too long sealed doors and reclaim the potential underlying the relation between the common production of the multitude and the knowledge of the real. Only a deep and canny critique emerging from a thorough understanding of the links between knowledge and power can offer us the tools to render that relation inoperative and take on the field of opportunity thus opened up for a new kind of practice. CRiMESCAPES: #MULTITUDES will work as a follow-up to the work began in our 2013 #crimescapes workshop focusing on the relation between architecture, law and crime. We started back then from the idea of crime as the violation of a line created by law and thus an undisputable spatial-laden concept. But the line is never a line, and so we began working on the modeling of specific legal zones as dynamic relational situations in order to test the effects that different spatial actions could have on their organization. Armed with these tools and with their precise knowledge of the situation the students were then asked to implement an architectural project understood as crime: architectural action as trespassing and reconfiguration of the divisions working in that legal zone. In this second installment, and as part of the #mpaa5 premises , our goal will be to produce by the end of the term, a material spatial trespassing of the new Spanish Public Safety Law in the city of Madrid. In order to do that we will begin by collectively build up a common body of knowledge, cartographies and models, of the material consequences the new law will have in the built fabric and the space production processess at Madrid’s Barrio de las Cortes. From that knowledge, a repertoire of existing practices and spatial tactics will be drawn through which development the students will be asked to propose a whole new set of spatial pragmatics to plan a final act upon the fabric of the city in the week of the European Parliament elections in May. In the first weeks of the term the students will collectively analyse the spatial consequences that the Public Safety Draft Bill would have in its hypothetical application—materialization in a specific and traditionally contested neighbourhood of Madrid (Barrio de las Cortes). First through a cartographic approach to the existing nomoscape of the area, and then through its modeling in order to visualize it and make it accesible to the non-specialized public for the open debate sessions that will follow. – PUBLIC ORDER, considered as one of the core concepts of the spatial materialization of politics understood as management of the sensible world. 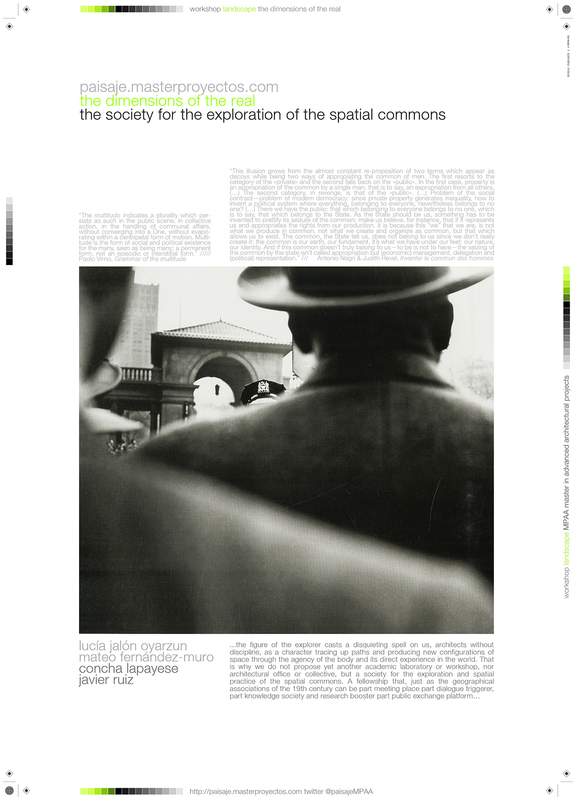 It will force us to acknowledge the consequences the public/private divide had both in the building of the modern urban space and in the emergence of architecture as a modern discipline, and it will open as well, through its dissolution, a field of opportunity for contemporary practice. – THE COMMON, not understood as natural resources or a synonym for the public, but as the shared production of the collective social body . We will specifically focus on space as one of the fundamental dimensions of that common production, key concept in our claim for architecture as practice and not discipline. In a second phase of the term we will work on a REPERTOIRE OF SPATIAL PRACTICES. We understand that when we talk about the actualization of the multitude’s political potential opportunity cannot be read only in its temporal dimension (kairos) but also spatially. The existence of spatial moments or right spots that respond to an active understanding of form , will define the work of these weeks. Existing spatial practices will be collected paying special attention to the notion of disposition in the relation between body and urban form in each and everyone of them . Based on that first reading of the repertoire and on the individual work developed by the students in the Fall Landscape Lab, they will be asked to propose to incorporate to it a new set of spatial practices. Finally, and given our aforementioned desire of full daylight even if that means fire and madness , we propose the CONSTRUCTION OF A LANDSCAPE-MULTITUDE in the city of Madrid during the week of May the 19th, when coinciding with the European Parliament Elections we will try to materially frame the following question: can a debate on the concept of political representation against that of democratic presence go further than words and integrate words, action and urban fabric?